Employers are liable for FICA and FUTA federal payroll taxes, as well as SUTA and SUI in most states. 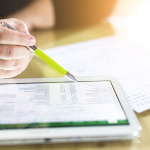 Quickbooks Enhanced or Full Service payroll makes it very easy to calculate payroll taxes, however, there are a few steps required to set up taxes first. This article is the third in our 3 part series on QuickBooks Payroll. If you have not set up your employees yet, you should do that first. 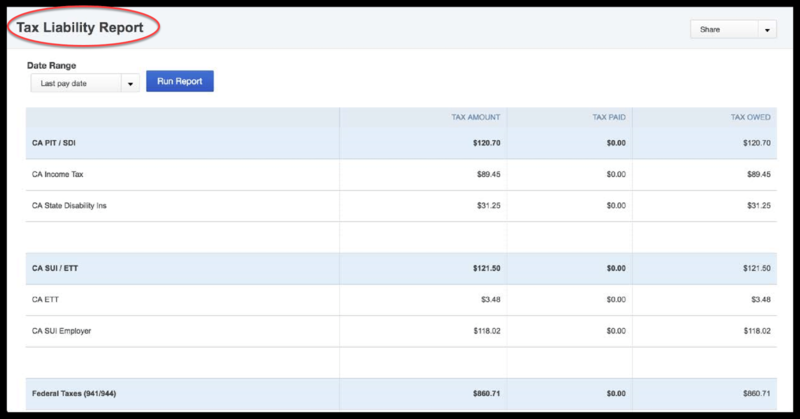 Head over to our QuickBooks Payroll Setup guide for step by step instructions; once you’re done, come back to this article to get those taxes setup. If you happened to just stumble on this article and you would like more info on the payroll services available, check out our Intuit Payroll Services guide. (*) These items only apply if your state collects income tax. From the left menu bar, click on “Taxes” as indicated in the screenshot below. Navigate to the Tax Center in QuickBooks Online. In addition to calculate payroll taxes, you can also track sales tax in QuickBooks Online. Make sure that you have “Payroll Tax” selected as indicated in the screenshot below. Click on the Payroll Tax Center tax in QuickBooks Online. In the screen are helpful tips on information that you will need to have handy as we discussed in the previous section. One of the benefits of using QuickBooks Payroll is tech support is included with your monthly subscription. You can reach a customer support rep via chat or by telephone just by clicking the “Contact us” link as indicated above. In the next screen, you should see a list of employees that you have setup. 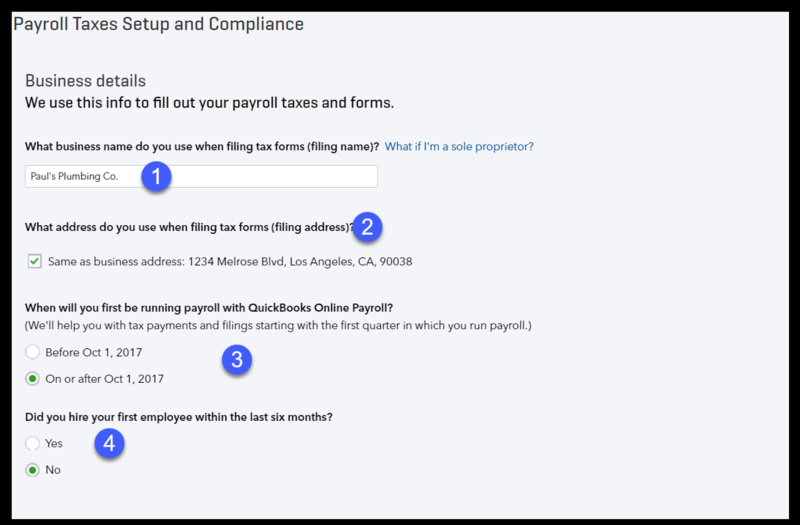 Note: If you need to add an employee, check out our QuickBooks Payroll Setup guide for step by step instructions. Add Employee Birth Date and Hire Dates to complete Payroll Tax Setup in QuickBooks Online. In this screen you will need to have the birth date and hire date for each employee handy. You should be able to obtain this information from the I-9 form or other new hire paperwork completed by employees. You can also review the W4 info that was entered when you set up your employees. Just click on the “W4 info” link as indicated in the above screenshot. Below is a screenshot and a brief explanation of the information you need to enter about your company. Enter Business Name, Address and the date of first payroll run in QuickBooks Online. Business name: Enter the legal name of your business that you use on all tax return filings. Business address: The address that you entered for your business during payroll setup will automatically populate here; if you use a different address then instead of putting a checkmark you will see fields where you can enter the correct address info. Date you plan to run first payroll: Provide the date that you plan to run your first payroll. This information is key for tracking payroll tax payments. Your date options will be based on the current month and year that you are in. Date you hired your first employee: If you hired your first employee within the last six months, select “yes”; otherwise, select “no”. Below is a screenshot along with a brief explanation of the information that is required for federal taxes. Enter Info for Federal Payroll Tax Setup in QuickBooks Online. FEIN: Enter your federal tax id in this field. If you don’t have it, you can select “No” if you have not received it yet or if you don’t have it handy. However, if you have not applied for a tax id number, you can find out how to do that here. Note: While you can run a payroll without a federal tax id #, you cannot submit your payroll tax payments to the IRS without one; Having this number ensures that your business will receive credit for all tax payments made. Payroll Tax Form: Select the payroll tax form that you are required to file with the IRS. 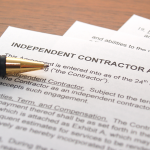 The options here are Form 941 which is filed quarterly or Form 944 which is filed annually. If you’re not sure which form you should file, check out our payroll accounting guide to find out. Federal Tax Payments: From the dropdown, select how often you are required to pay federal payroll taxes. The options here are semi-weekly, monthly or quarterly. If you’re not sure how often you should file, check out our guide or contact the IRS. Non-profit status: If you are a 501(c)(3) non-profit business that does not pay FUTA, select “Yes”; otherwise select “No”. Below is a screenshot along with a brief explanation of the information that is required to calculate state taxes, if applicable. Note: If you are lucky enough to live in one of the 7 states without a state income tax (AK, FL, NV,SD,TX,W A,WY) then you will not see this step during your payroll setup. 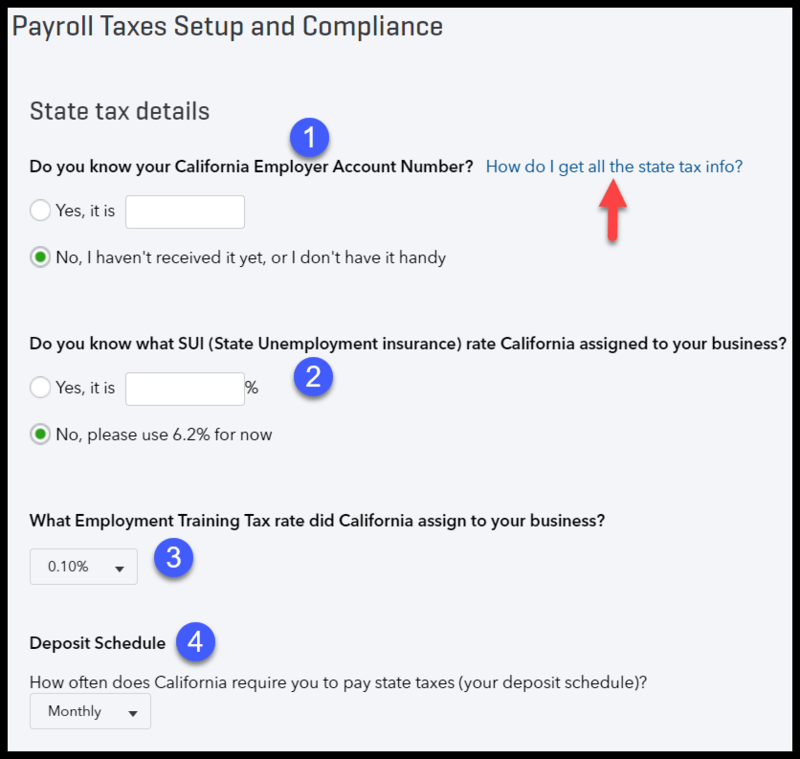 Enter Info for State Payroll Tax Setup in QuickBooks Online. State Employer Account Number: This is a unique number issued by the state to employers. Similar to the FEIN number, it is used to keep track of payroll tax payments made by employers. If you don’t have a state account number, you need to contact the Employment Development Department for your state and request one. Note: I do not recommend that you file tax returns or make tax payments without this number. If you do, you run the risk of not receiving credit for the payment because it will be difficult for the EDD to identify you without an account number. State Unemployment Insurance (SUI) Rate: Each year around November or December you will receive a letter from the EDD for your particular state; it will include the SUI rate that has been assigned to your business for the coming year. If you have not received this info, contact the EDD to obtain this information. Note: To ensure your payroll taxes are calculated correctly, make sure you have the correct SUI rate before processing your first payroll. Employment Training Tax: This training tax is generally the same for employers in the same state. With that said, this field will automatically populate based on the state where your business is located. Deposit Schedule: Based on the amount of your payroll taxes, the state will require you to pay(deposit) your taxes on a monthly, semi-weekly or quarterly basis. This information should be included with your employer account number but if it is not, you will need to contact the EDD for your state to obtain this information. In this step, you need to indicate how you will make your payments. Below is a screenshot along with a brief explanation of the two options available. Note: E-Pay and E-filing is not available with Quickbooks Basic Payroll. Learn more about Quickbooks Payroll editions. Select how you want to pay your taxes in QuickBooks Online. E-pay and e-file: This option allows you to electronically file your tax forms and make your tax payments. I highly recommend that you select this option. When you e-pay and e-file, you receive a confirmation that your tax forms/payments have been submitted immediately after you have made them. If for some reason there was an issue with receipt, you will have a confirmation with a date and time stamp to prove that you filed and paid on time. Manually with paper coupons: This option allows you to make your payments by check and submit a paper coupon (similar to a remittance) so that your company receives credit for filing tax forms and making payments. Note: If you’re going to go the snail mail route, be sure to send your payment via certified mail with a return receipt. This will ensure that whomever is on the receiving end has to sign for your letter and you will receive a copy of that signature along with the date received. You will need to keep this info on file should you ever need to prove that you paid/filed your taxes on time. 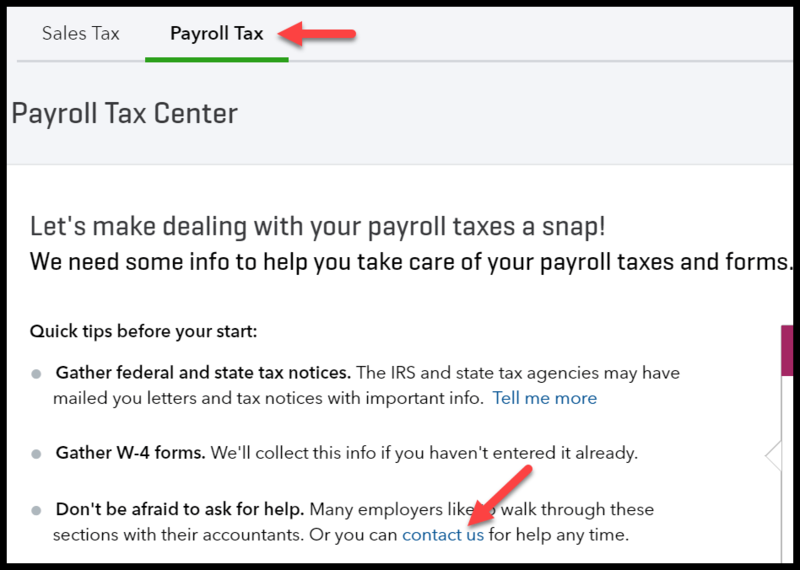 Once you have completed all of the setup info, you can navigate back to the Payroll Tax Center clicking on the Gear icon and select Payroll Settings as indicated in the screenshot below. 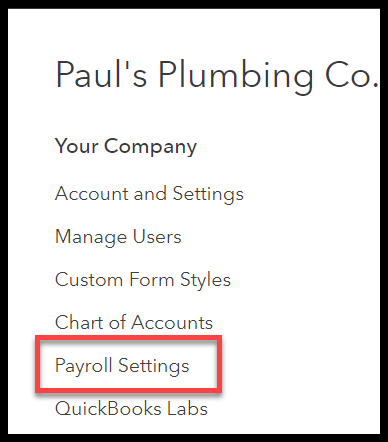 Navigate to Payroll Settings in QuickBooks Online. Click on the “Pay Taxes” button and follow the on-screen prompts to make your tax payments as indicated in the screenshot below. Pay Taxes Directly within QuickBooks Online. Now that you know how to set up payroll tax payments, there may be times when you need to make changes to your tax setup or you may just want to look at tax forms that you have previously filed. 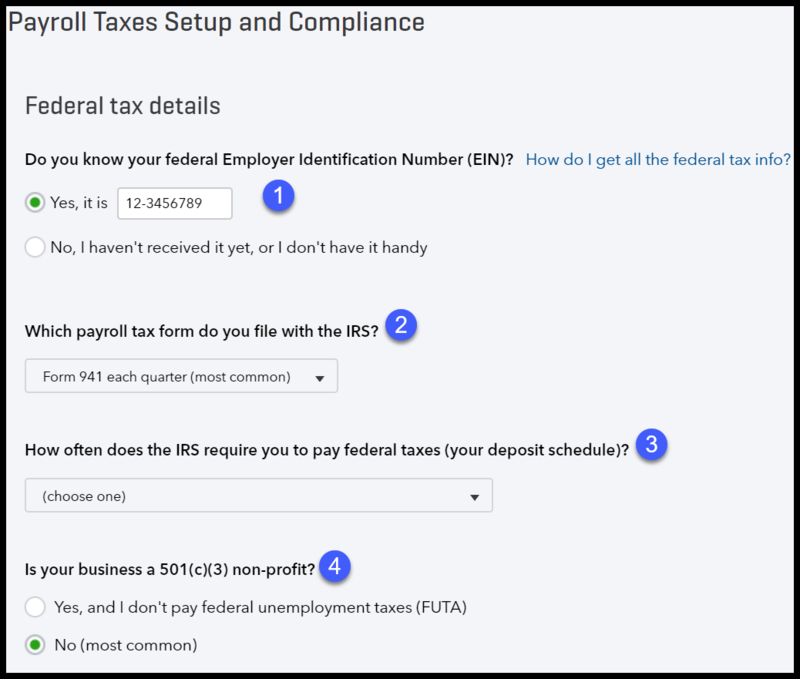 Click on the Gear icon from the home page and select Payroll Tax Settings as we did in the previous step. The Payroll Tax Center will display as indicated below. Let’s discuss in detail what info you can find here. View/Edit Payroll Taxes & Forms in the Payroll Tax Center within QuickBooks Online. 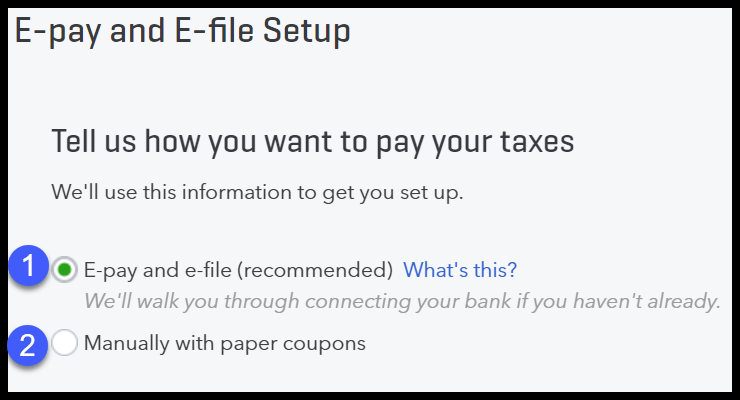 Edit your e-file and e-pay setup – Make changes to how you file/pay your taxes here; including the bank account that your taxes are withdrawn from. Edit your tax setup – Make changes related to your FEIN #, State account number, tax forms you are required to file and your payment (deposit) schedule. Sample Payroll Tax Liability Report run in QuickBooks Online. View tax payments you have made – Take a look to see the details of the tax payments that you have made; including the tax type, amount and the tax authority (payee). Enter prior tax history – If you are converting from another payroll system and you have made tax payments this year, you will need to enter that information here so that your tax returns/payments going forward will be correct. Quarterly Forms – You will find all completed payroll tax forms that are due on a quarterly basis (i.e.Form 941) here. You can print a hard copy to mail or save them as PDF documents to your computer. Annual Forms – You will find all payroll tax forms that are due on an annual basis (i.e. W2 forms, Form 940) here. You can print a hard copy to mail or save them as PDF documents to your computer. Employee Setup – If you need to provide employees with an I-9 or W-4 form to complete, you can find blank copies here. You can also find archived copies of completed forms here as well. Employer Setup – If you need to apply for an FEIN # or State Employer Account #, you can find applications here. You will also find archived copies of any forms previously completed here as well. Now that you know how easy it is to set up and make your payroll tax payments using QuickBooks Payroll, you’re ready to run your first payroll! If you haven’t set up your employees then head over to our QuickBooks payroll guide for step by step instructions. If you’re planning to file your own tax returns this year, why not make tax time a breeze by using TurboTax, our recommended tax software. Check out our tax software guide to see who made the cut. On behalf of our QuickBooks expert, we thank you for your kind words!